Kristen was great to work with!! She is very kind and professional. My husband and I were going back and forth on whether we would get a videographer or not, and we both agree it was the best decision we made! As soon as Elmer with Kristen we knew we wanted to go with Love Captured Productions. She was so accommodating and really helped us with a package that stayed in our budget. We are so grateful to have the highlight video and ceremony video as sweet reminders from our wedding day! Everything about the highlight video is amazing and I love having it to look back on!! I came to Kristen with a tight budget and huge wish list and she came through with a package that worked perfect for both of us. This video was something I dreamed about from the moment my husband asked me to be his wife. Kristen met with us several times to explain her process, really get a feel of what my husband and I were wanting and check out the wedding location and reception area. I was very particular of how I envisioned this film looking and even sounding. She took all of my visions and produced the most beautiful highlight film I've ever seen, even the music was spot on! I've watched it a million times already and I cry each time. I am forever grateful for Love Captured Productions for giving me this sweet reminder of the best day of my life. This is something we will cherish forever, share with our friends and family each holiday and show our children for years to come. I ❤️ Love Captured Productions!! Having my wedding captured on film was always a must-have! When we got engaged and it came time to seek out a videographer, I had met with 2, and immediately after meeting Kristen, I knew she and Love Captured Productions would be the perfect option for our big, small town country wedding! Kristen used her expertise to help answer all the questions that my fiancé and I had before the big day-being ever so thoughtful to even ensure our Celebrant agreed with all the plans. On the day of our wedding, Kristen and Chris worked so professionally and seamlessly with our photographer, as if they were a single unit. We could nothave asked for a better, more thoughtful team! On the day we received our highlight video, my husband and I, along with my Mom, were able to project it on our TV to watch for the first time. 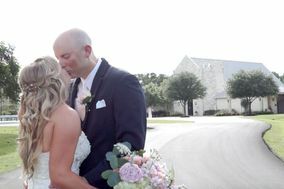 I had shed many tears watching their videos of people I didn’t know, but here we were, reliving the day as if we were guests at our own wedding, now shedding tears as we watched my husband get choked up as I walked down the aisle. The way Kristen intertwined the musical lyrics into the events of the day blew us away and I seriously can’t stop watching!! We never want to forget these memories and now, thanks to Love Captured Productions, we never will! I know I’ll be watching this footage again and again and look forward to sharing it with our kids someday! I would highly recommend Love Captured Productions !! Kristen was fantastic! We had a limited budget and very specific things we wanted, and she worked with us to make it all happen! She was incredibly professional, responsive and the highlight video she made for us was so beautiful. She and our photographer worked so well together and I am so happy we made the decision to have a videographer at our wedding. I would definitely recommend them to any couple for their wedding day! Kristen and Chris are nothing short of amazing. From our very first meeting until even after our wedding day, they have been extremely professional. They went above and beyond to capture the most special moments in our wedding day, and even more so, took opportunities to know us on a personal level. We never felt pressured or uncomfortable when discussing our expectations or theirs. Our videos turned out beautiful and we are so excited to have them for a lifetime. You will be more than happy to choose them for your big day! 5 stars all the way around for this wonderful team! Kristen was probably the best vendor we had. She went way beyond the call of duty and the video was better than we could have imagined. She happened to send a still photo while the photographer was taking pictures and it came out better than the professional photographer we paid $$$$$. I actually have that photo as my screensaver on my phone. All I can say is that husband and wife team was an answered prayer for us and worth every penny. The highlight reel was awesome. I loved the way they showed some of the venue by itself just for a few seconds. It was by a train track and they somehow caught a train going by. They showed the bride getting ready and things you don't think about until you see the video. You need them. They're great with the details!! Kristen and her husband were incredible to work with. They were very open and responsive to any requests we had and took the time to figure out what we wanted and contact our other vendors. They got there early day of, were super flexible, and we LOVED our video. We highly recommend them! Kristen and her husband were an absolute pleasure to work with! They went above and beyond to capture our special day. She was very responsive and understood everything I was looking for to capture my wedding day. We will definitely be using her for future family endeavours. You can't beat great quality work affordable pricing and a great couple to work with. I highly recommend! I can't say enough about this husband/wife team. Not only do they do fabulous work, but they are 100% genuine people to work with. They take the time to get to know you! I can't stop watching my engagement photo session video Love Captured Productions filmed and created for me. Everyone is raving about it. Looking forward to my next event with yall! Thanks again for creating memories during this special time for us! They are a awesome couple that listens and appreciates your business. Great down to earth people.